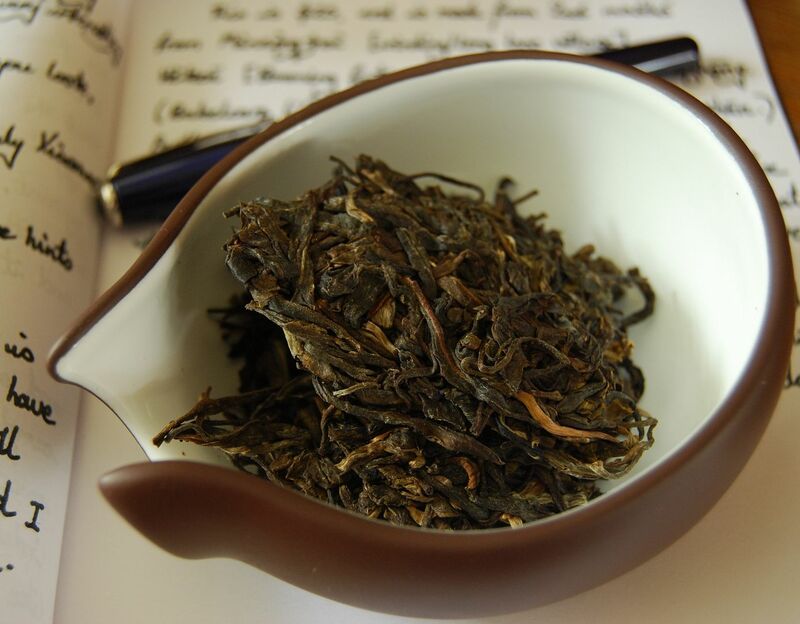 The Half-Dipper: 2009 Yunzhiyuan/Ruicaoxiang "Bulangshanyun"
I'm actually ok with the age, I like having a headstart eg.3yrs ahead in this case. Afterall time is money but in this case it hasn't transformed enough to impress me. It's certainly smooth but would prefer it to have a more expressive aroma and a better huigan. This could be a result of not pressing the maocha right away. Not a weak pu though for those who like a cup after a heavy meal. True Hobbes, it is certainly a contributing factor to the final product. I kinda liked Gamma. Full round flavors, sweet, malt and dates. Full round flavors with no sharp edges. Reminds me of shu minus the funk. Special about the leaves are the long stems. They smell deep-sweet like dried raisins. The taste misses this promise of sweetness, there is just a bit of it. Bitterness is dominating but it's not overwhelming. 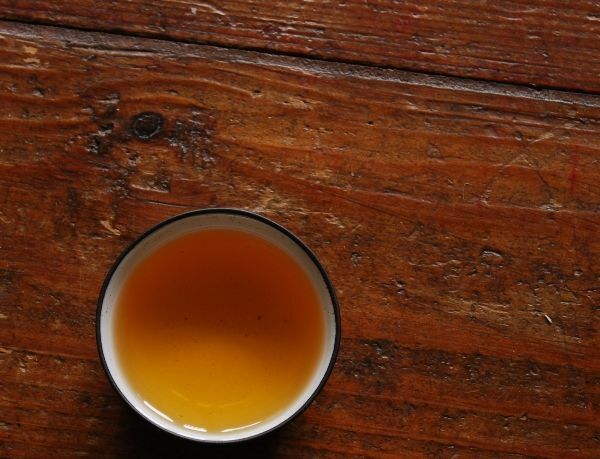 I love a shot of bitterness in teas and this tea has some mellowness which prevents astringence. As I have sipped this tea I got confused by its flavor. The main characteristic for me was the impression that the flavor went missing. Like the taste of once rich smelling herbs which have lost their aroma over the time of some hot summers. But after the first confusion about this I actually liked it. This tea had some emotional impact on me; it was down-to-earth and a bit melancholic. A nice calming effect. I posted my comments before reading yours. Now I have read them and want to add: I also had the impression, this tea tastes older than its actual age for a sheng pu'er and I too had the impression of a slight similarity to shu pu'er in taste. Much darker leaves than alpha or beta (I think beta was lightest so far). Darker aroma from the dry leaves as well. 10s rinse: Darker and mustier rinse water. 5s: Soup is very orange compared to the others so far. Very mellow and somewhat bland. 7s: Orange soup. Some minor bitterness. Not much else in the way of flavor. Maybe a bit of wood but not much. 15s: Much more bitter now. Empty cup smells ever so slightly of baked apples without the sweetness. Soup is orange and flavors muddy. Not crisp. 20s: More bitterness and less flavor. 25s: The decline has started. From here on out we quickly lose all the flavors and bitterness. The liquor stays soft and dark but little else remains. Nothing to see here, unfortunately. Nice mouthfeel but little else to recommend it. I don't think I'd pay for this. Is this a bulang? It's got the ku but seems to lack the rest and I used almost 9g! One posted the 'Delta' notes... you got me. Anyways the notes for the 'gamma' will come in a few days. The gamma was interesting because it showed tell tale signs of age which was apparent in its taste, colour, and smell. One enjoyed its aged malty mellow tones, its changing mouthfeel from syrupy velvet to thin. This tea seemed to almost lack qi. What was there seemed to just fumble in the background. taste is where the ku should be. I was very surprised that my first impression was that this reminded me of shupu. 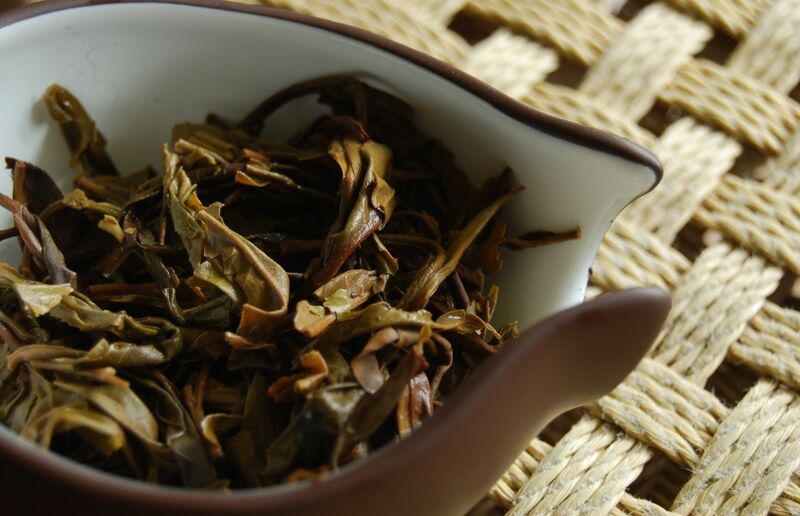 New to Chinese tea and new to Pu-erh, I have little to compare with or judge by. I ordered the 5 samples kit to get a bit of a spread in these types of tea. I just struck gold when you lot decided to make this a world wide tasting event. A chance to learn... I have not tasted the others yet, as my set did not came marked Alpha, Beta and so on. I started with this one because I also ordered a cake of this one (moderate price, made from slightly older tea, I was hoping for a 'drink now' tea). 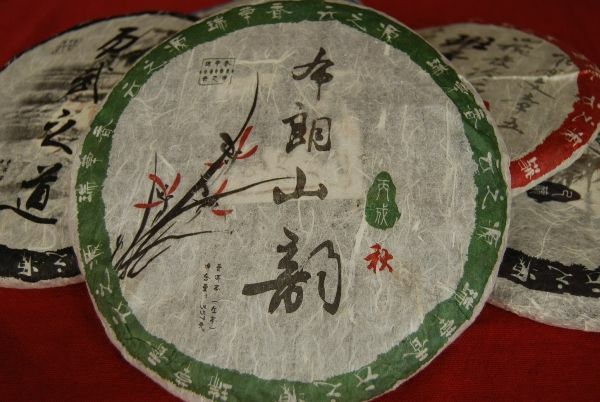 So far I have not been disapointed, in fact this tea is the best I have had up till now(one mysterious cake called 'Yunnan Chitsu', a sample of 'Star of Bulang', and some rather vile loose Pu-erh from a local chinese food store). The smell of this tea in the warm pot is a lot more pronounced then what lingers in the sniffing cup, and reminds me of wet soil in a pleasant way. Nice for the season, as fall is just starting in the Netherlands. The taste is not very strong but nice, warm and slightly better during the first few brews, and gets sweeter and even softer later on. It seems I can brew this twea for longer then I did. I started out with 4 grams in a 100 ml pot, and the first 10 second brew after 2 rinces was slightly weaker then I think it should be. So I upped the second brew to 30 seconds. The outcome was more like what see in Half Dipper's and Mattcha's pictures. More taste, better. Mcuh to my surprice, I think this tea did stand up well during repeated brews. It got sweeter, but as I increaed brewing time, it remained tastefull at least 10 brews. I am pretty happy with this one. Thank you for teaching me how to brew Pu-erh :-) It will be some time before I go through all the samples, as I want to hone my brewing skills on this one. I appreciate your notes - thanks for joining in. I liked the fact that you're starting slowly with less leaf - it's the best way to control the bitterness, which can be something that puts off the newcomer. Excellent work! Drop me a line (hobbesoxon at gmail) if you'd like some recommendations for low-risk pu'er, as there are some Menghai and Xiaguan cakes that are great to start out with. Though the chaps above mention a reminiscence of shupu, I can assure you that 0% of the leaves in this tea have undergone wodui. I'm unclear as to how you reached your conclusion! Have you tried it? As a quick summary: Pleasant, woodsy in a way that for me was evocative; though the body was rather light, and the pu-erh tasting did not last as long as I would have hoped. I attribute this to my white belt in gongfu, though. I read your notes with great interest! It sounds as if the tea has come on very well. I believe that my sample has long since gone, because I gave the remainder of my samples to someone else so that they could join in the group tasting that we were undertaking at the time.